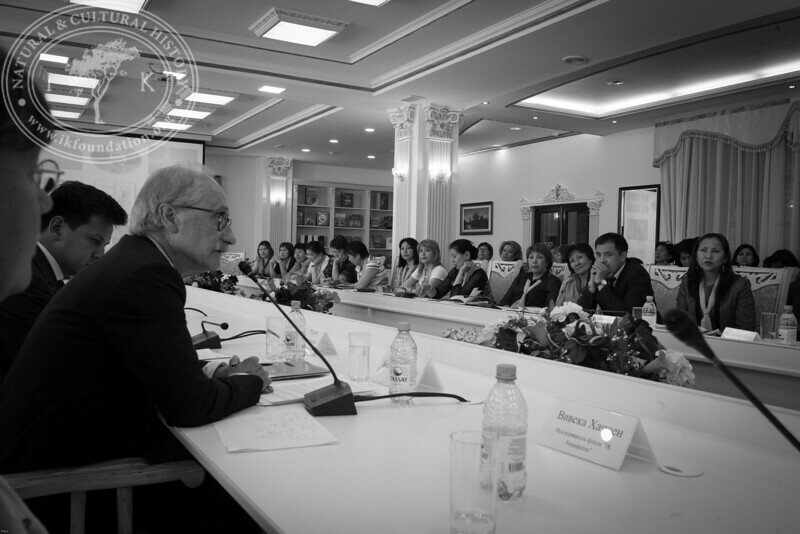 ”The Linnaeus Apostles Bridge Builder Expeditions - Sweden, Kazakhstan, Kyrgyzstan & Russia. Including Launch of The Explorer’s Field Guide”. 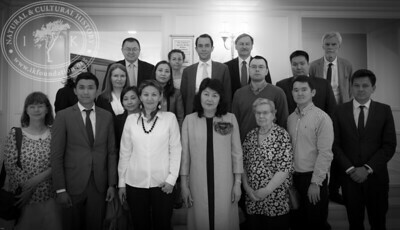 Participants from top/left: Mr. Nourlan Mamyrov [Honorary Consulate of Sweden in the Kyrgyz Republic], Mrs. Nadia Voinova [Spouse of Ambassador in Astana], Mr. Christian Kamill [Ambassador of Sweden in Astana], Mr. Alexey Koropchenko [Counsellor, Embassy of Russian Federation], Mr. Lars Bergman [Swedish Culture Abroad], Ms. Anna Orischenko [Oriflame Kazakhstan and Central Asia], Ms. Irina Shubina [Library of KazGUU university], Ms. Tolkin Abildaeva [National Academic Library], Mr. Sobisevich Alexey Vladimirovich [Russian Academy of Sciences], Mr. Mambetalinov Rakat Mazhikenovich [Institution "Management of culture, archives and documentation of the akimat of the North Kazakhstan region”], Mrs. Viveka Hansen [The IK Foundation], Mr. Madi Akylbekov [National Museum of the Republic of Kazakhstan], Ms. Beibit Shangirbayeva [EU Delegation to the Republic of Kazakhstan], Ms. Ainur Nogayeva [ENU], Mrs. Bakashova Jyldyz Kemelovna [National Library of the Kyrgyz Republic], Ms. Aleksandrovskaya Olga Andreevna [Russian Academy of Sciences], Mr. Sergazy Akhmetkul [Swedish Alumni] and Mr. Ruslan Urazalinov [Embassy of Sweden]. 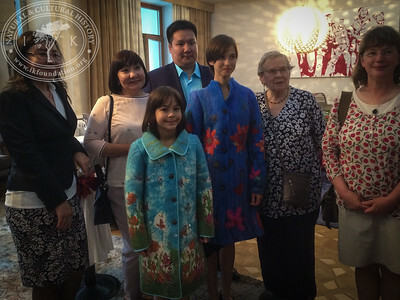 NOT IN THE PICTURE: Mr. Gabriel Hjort [Embassy of Sweden in Astana], Mr. Lars Hansen [The IK Foundation], Mr. Bo Ralph [Swedish Academy], Mr. Bengt Eriksson [Interpreter], Mrs. Mukusheva Gulnara Butanovna [North-Kazakhstan Museum of History and Local Lore], Ms. Orynbaeva Gulmira Usenbaevna [Central State Museum of the Republic of Kazakhstan], Ms. Kunikei Sakhieva [National Museum of the Republic of Kazakhstan], Mrs. Umutkan Munalbaeva [National Academic Library of RoK], Mr. Bikenev Rustam Tolegenovich [National Center for Manuscripts and Rare Books], Ms. Renata Faizova [KAZGUU University], Ms. Olga Kurdyukova [Interpreter] and Ms. Gulmira Abidkhozhaeva [Embassy of Sweden in Astana]. 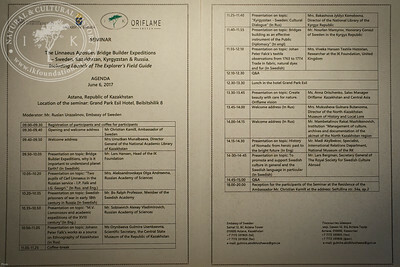 Seminar agenda at ”The Linnaeus Apostles Bridge Builder Expeditions - Sweden, Kazakhstan, Kyrgyzstan & Russia. Including Launch of The Explorer’s Field Guide”. Sobisevich Alexey Vladimirovich from the Russian Academy of Sciences in Moscow; at ”The Linnaeus Apostles Bridge Builder Expeditions - Sweden, Kazakhstan, Kyrgyzstan & Russia. Including Launch of The Explorer’s Field Guide”. 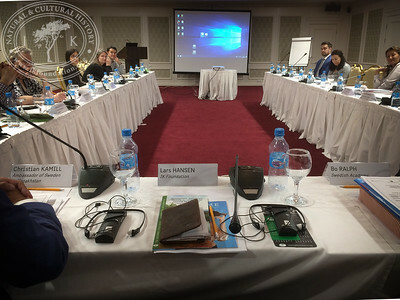 Seminar room at Grand Park Esil Hotel in Astana. 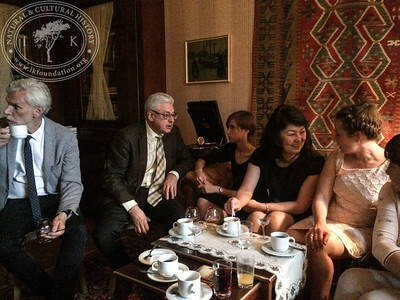 ”The Linnaeus Apostles Bridge Builder Expeditions - Sweden, Kazakhstan, Kyrgyzstan & Russia. Including Launch of The Explorer’s Field Guide”. 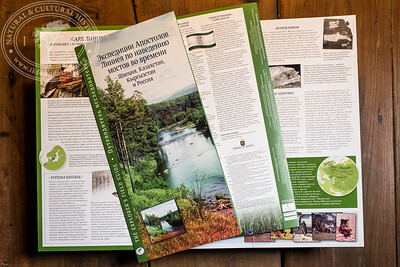 The launch of The Explorer's Field Guide ”П у т е в о д и т е л ь и с с л е д о в а т е л я | Экспедиции Апостолов Линнея по наведению мостов во времени – Швеция, Казахстан, Кыргызстан и Россия” [ The Linnaeus Apostles Bridge Builder Expeditions– Sweden, Kazakhstan, Kyrgyzstan & Russia ] at ”The Linnaeus Apostles Bridge Builder Expeditions - Sweden, Kazakhstan, Kyrgyzstan & Russia. Including Launch of The Explorer’s Field Guide”. 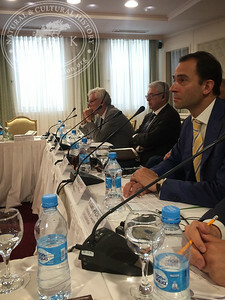 Lars Bergman, Secretary General of The Royal Society for Swedish Culture Abroad, Bo Ralph, Member of The Swedish Academy and the Ambassador of Sweden, Christian Kamill. 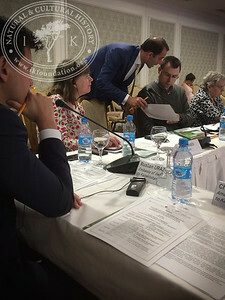 Moderator Ruslan Urazalinov from the Embassy of Sweden, Viveka Hansen, The IK Foundation et al. 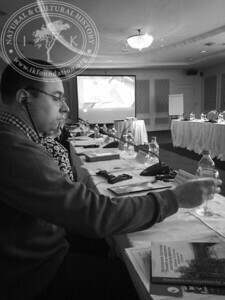 at ”The Linnaeus Apostles Bridge Builder Expeditions - Sweden, Kazakhstan, Kyrgyzstan & Russia. Including Launch of The Explorer’s Field Guide”. 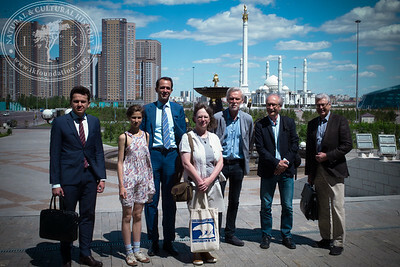 Swedish representatives visiting The National Museum of Kazakhstan as part of the seminar ”The Linnaeus Apostles Bridge Builder Expeditions - Sweden, Kazakhstan, Kyrgyzstan & Russia. Including Launch of The Explorer’s Field Guide”. 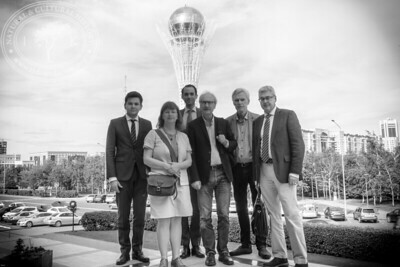 Swedish representatives just outside the entrance to The National Museum of Kazakhstan as part of the seminar ”The Linnaeus Apostles Bridge Builder Expeditions - Sweden, Kazakhstan, Kyrgyzstan & Russia. Including Launch of The Explorer’s Field Guide”. 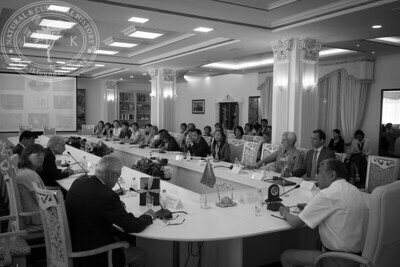 Discussions and visit to The National Academic Library of Kazakhstan as part of the seminar ”The Linnaeus Apostles Bridge Builder Expeditions - Sweden, Kazakhstan, Kyrgyzstan & Russia. Including Launch of The Explorer’s Field Guide”. 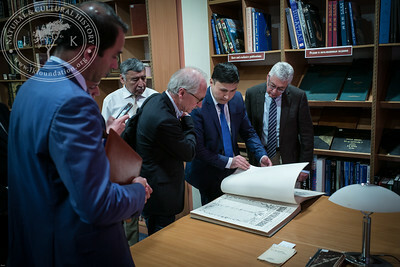 Visit to the Rare Book Collection in The National Academic Library of Kazakhstan as part of the seminar ”The Linnaeus Apostles Bridge Builder Expeditions - Sweden, Kazakhstan, Kyrgyzstan & Russia. Including Launch of The Explorer’s Field Guide”. 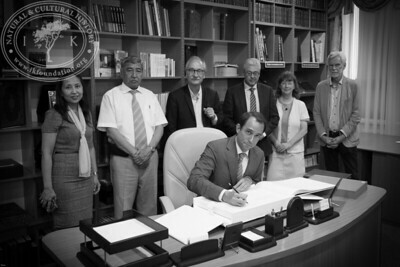 Guestbook signing in the Rare Book Collection at The National Academic Library of Kazakhstan as part of the seminar ”The Linnaeus Apostles Bridge Builder Expeditions - Sweden, Kazakhstan, Kyrgyzstan & Russia. Including Launch of The Explorer’s Field Guide”. 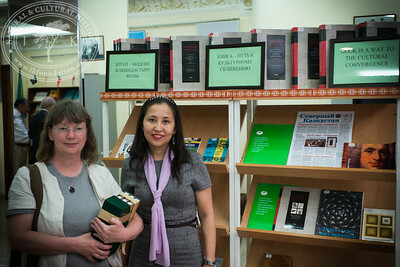 Small exhibition including Linnaeus' related books and Swedish literature in The National Academic Library of Kazakhstan as part of the seminar ”The Linnaeus Apostles Bridge Builder Expeditions - Sweden, Kazakhstan, Kyrgyzstan & Russia. Including Launch of The Explorer’s Field Guide”. 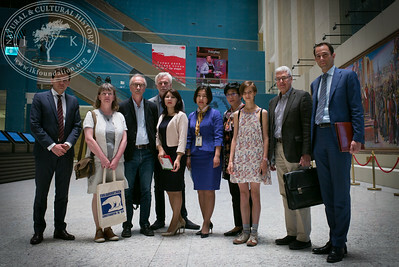 Swedish representatives [ Ruslan Urazalinov and Christian Kamill from the Embassy of Sweden, Viveka Hansen from The IK Foundation, Bengt Eriksson and Lars Bergman from The Royal Society for Swedish Culture Abroad, Bo Ralph from The Swedish Academy ] just outside the entrance to The National Academic Library of Kazakhstan as part of the seminar ”The Linnaeus Apostles Bridge Builder Expeditions - Sweden, Kazakhstan, Kyrgyzstan & Russia. Including Launch of The Explorer’s Field Guide”. 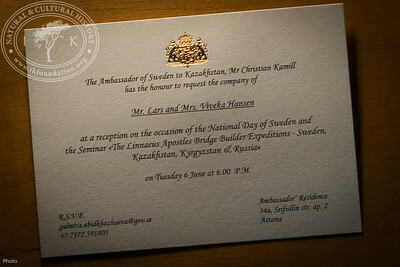 Invitation card to the Ambassador's Residence as part of ”The Linnaeus Apostles Bridge Builder Expeditions - Sweden, Kazakhstan, Kyrgyzstan & Russia. Including Launch of The Explorer’s Field Guide”. 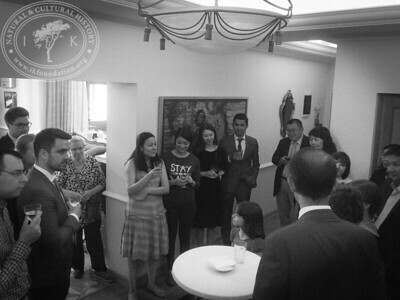 Guests in the Ambassador's Residence as part of ”The Linnaeus Apostles Bridge Builder Expeditions - Sweden, Kazakhstan, Kyrgyzstan & Russia. Including Launch of The Explorer’s Field Guide”.